I'm hopeful that the last cold snap is behind us and that spring is here for real now. After Sunday's snow storm, we still have a few patches of snow here and there, but the sun is peeking out from the clouds and the sky is blue. It's almost summer. 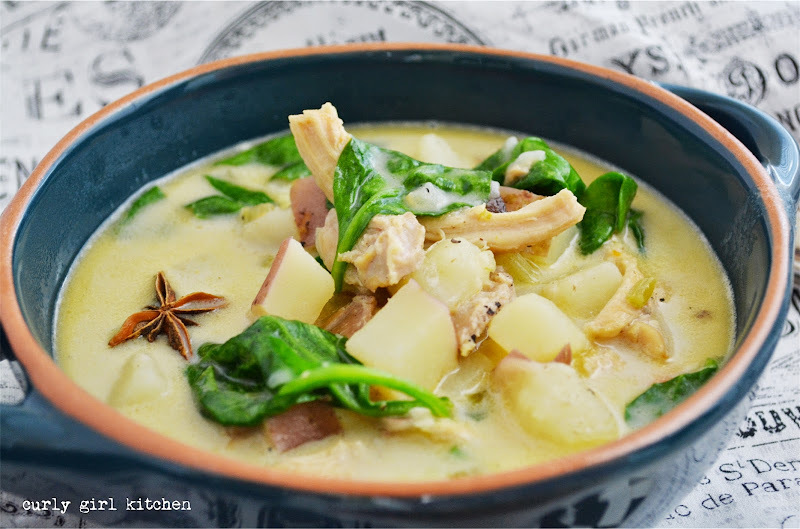 But for what I hope was the last bit of chilly weather, during which I crave comforting meals like hearty soups, I made this delicious chicken soup in a creamy coconut milk broth seasoned with cardamom and star anise. 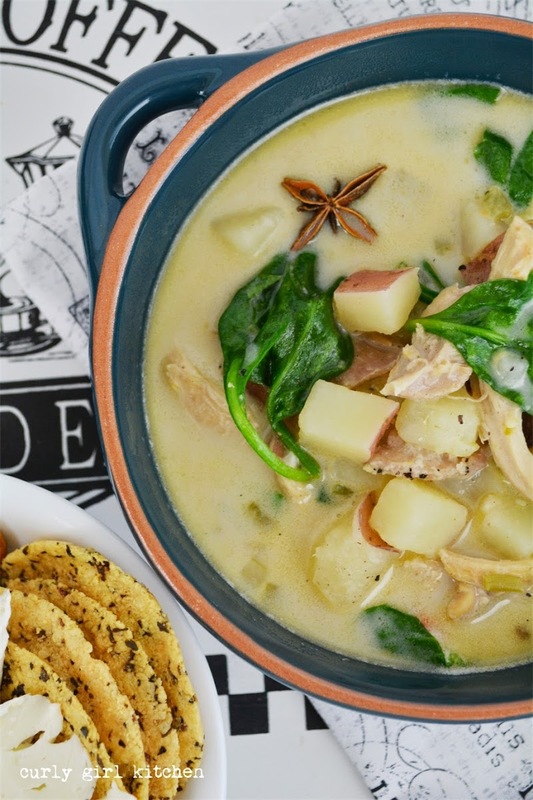 This soup was just what the weather called for. Heat a stock pot over medium heat, then add the oil. Add the onion, celery, carrot, garlic and ginger to the hot oil, with a pinch of salt and pepper; cook for about 5-7 minutes until softened, stirring occasionally. Stir in the cardamom and cook for another minute. 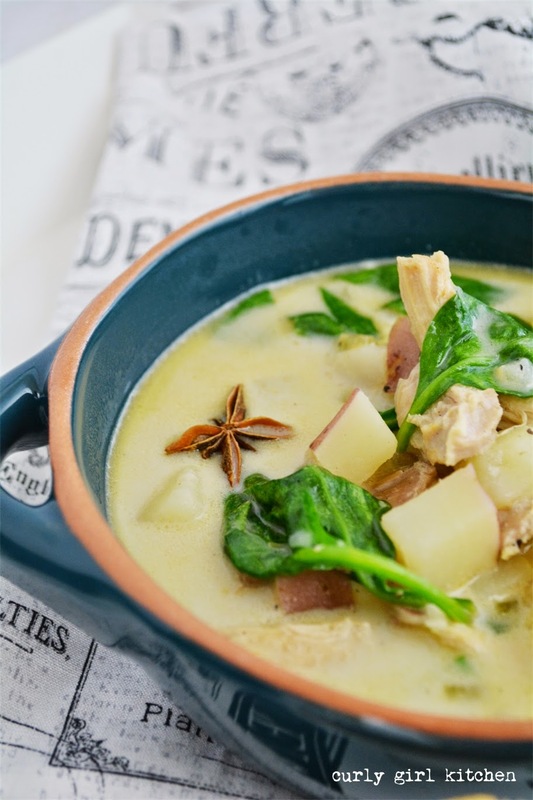 Add the coconut milk, broth, potatoes, chicken and a few star anise. Bring to a boil, then cover and simmer over low heat for about an hour. Use a spoon to skim off and discard any chicken fat that rises to the surface. Before serving, taste and add more salt and pepper, if needed. Stir in spinach and cream.